12.5 cm tall (5 inches) each. 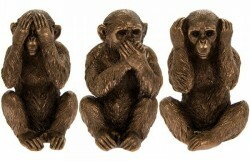 See Hear Speak No Evil Monkeys. Weighty figurines. Price is for the 3 separate figurines. Excellent detail and very nice quality finish. Solid Cold cast resin bronze. From the Leonardo collection released Jan 2019.